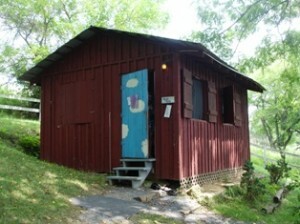 Nestled in the mountains, the Farmhouse is the epicenter of camp and where the camp offices and bathrooms are located. The house is a historic structure, built 160 years ago from timber felled in the surrounding forests, and is the year-round home of Anne and Jud Millar. 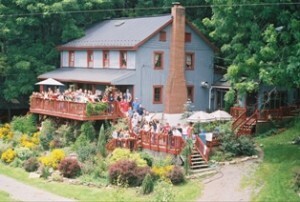 The Farmhouse is a warm and welcoming building that helps make campers feel at home at SMA. Our cabins are rustic and comfortable, the perfect summer home while at SMA! We have six cabins that surround the Farmhouse, three for the girls and three for the boys. Cabins have bunk beds with enough room for 8-10 campers and a counselor. There is electricity in the cabins, and the bathrooms and showers are just a short walk away in the Farmhouse. Our cooking and dining facilities are located in a big, gray building we affectionately call “The Rhino.” With a large kitchen and veteran staff, it’s easy for us to serve home-cooked food that’s healthy and delicious! We offer seating inside The Rhino as well as picnic tables outside in the sunshine or shade. 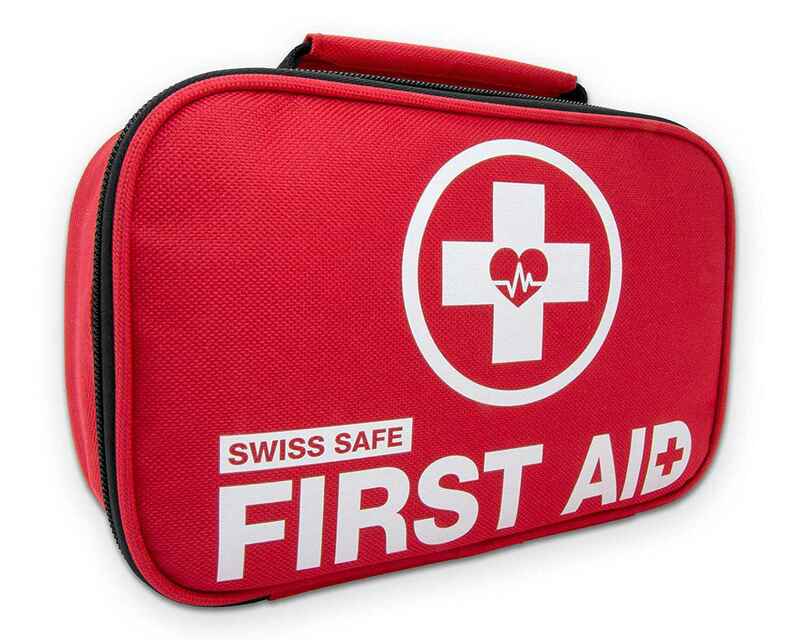 Our Med Room is located in The Rhino, and all of our staff members have training in first aid. It is our policy that all medications are kept safely and distributed by our camp staff at mealtimes or as needed. All minor medical issues are handled by our camp medical staff. 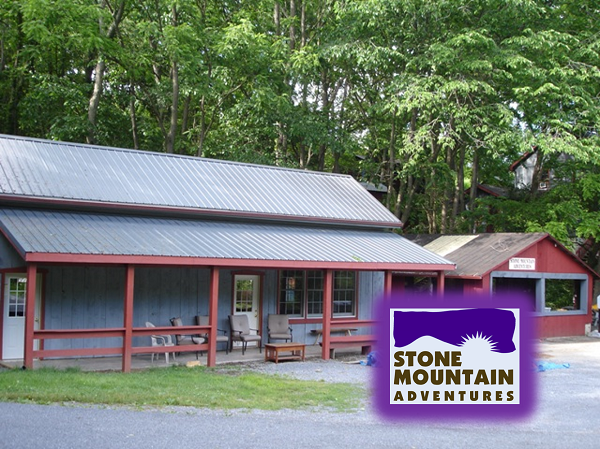 We also have a camp doctor who makes house calls to Stone Mountain Adventures when necessary, and we are located eight miles from Blair Memorial Hospital in Huntingdon, Pennsylvania. 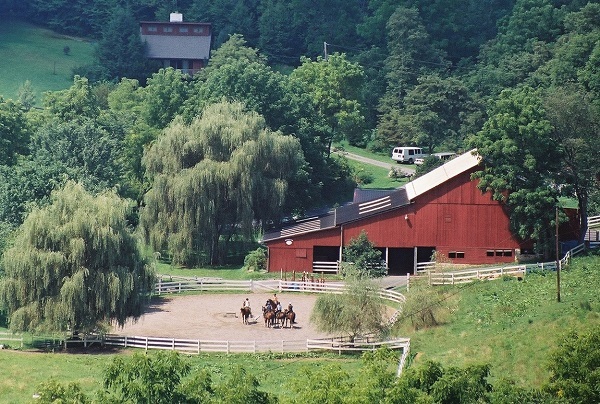 Home base for Horsepower Farm and SMA’s Horsemasters program, the barn is one of the most important buildings at camp. Aside from hosting evening meetings and activities, the barn is also home to the Bike Shed and the Climbing Shack, where some of our most awesome adventure gear is kept! Downstairs, the stables provide a wonderful home for our horses. Upstairs, campers can explore their creative sides in the well-stocked Art Studio. Down a few steps from The Rhino and the Farmhouse is our Game Room, a space for campers to chill out and have fun. 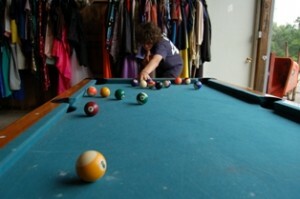 There’s even a pool table! Attached to the Game Room is our Music Studio, featuring a PA system, drum kit, and all the equipment necessary for a camp band to practice and perform. The big swinging doors to the Music Studio even open out all the way, turning the room into an open-air stage! We often offer Music Jam as an activity, and campers are welcome to spend time in the Music Studio if accompanied by a counselor. The Music Studio also provides a space for campers to be a radio DJ! WSMA’s show of the day, hosted by campers, is broadcast over the camp-wide PA system when everybody returns from their afternoon activities. Together, the Game Room and Music Studio make a great space for campers to hang out during each afternoon’s Power Hour of Freedom! A short walk down the road from SMA is a climbing area called Donation Rocks, which every camper will pass on the way to camp! Donation Rocks consists of three main climbing walls (with additional smaller walls) owned by Stone Mountain Adventures. The 30-50ft sandstone cliffs are mostly top roped with very easy top side access. There are 70+ established routes at Donation Rocks with the potential for more with some imagination. At Donation Rocks you will find ample crack climbing, friction face climbing, off-width cracks, and much more. The Donation rock climbing crag is rich with climbing history and lore, and it has been a popular destination for climbers and outdoor groups from around the country for many decades. In the forests around camp lies Director Jud’s most ambitious project to date. Summer after summer, campers and counselors alike love to ride the official SMA bike trail, which features rollers, moguls, banked turns, jumps, and more! Campers even get the chance each summer to help build out the trail as part of SMA’s service initiatives. Thanks to our small camp size and close proximity to gorgeous Raystown Lake (the largest lake in Pennsylvania), we can offer exciting water sports every day and teach them effectively with a great camper to counselor ratio. Water sports at SMA include wakeboarding, waterskiing, kneeboarding, sailing, stand-up paddleboarding, whitewater rafting, canoeing, and fishing. The award-winning Allegrippis Trails, some of the best on the East Coast for mountain biking, are also located at Raystown Lake. Often nicknamed “Freezewood” for its refreshingly chilly waters, the lake at Greenwood Furnace State Park has seen generations of SMA campers go for swims and play frisbee. With pavilions, a playground, and a sandy beach, Greenwood is one of our favorite spots for All Camp Day festivities! Smaller and more intimate than Greenwood, Whipple Dam State Park is a great place to go swimming and play volleyball. Shaded picnic areas are also a plus! Home of hiking trails and beautiful forests, Rothrock State Forest is also a great location for us to do some awesome mountain biking! Some of the most dramatic cliffside hikes in the region can be found at Trough Creek. A rushing river and a balancing boulder are some highlights of this State Park. Located in Huntingdon, PA, Juniata College is generous enough to let us use many of their facilities, such as tennis courts and athletic fields. One of the most popular options is the expansive Frisbee Golf Course, which makes a great location for a chill and fun activity, morning or afternoon!